JAPAN: Onkyo's micro-amplifier challenges low-quality amp chips | What Hi-Fi? The fact these can operate on a small current means the amp can maintain its output even on a low voltage. The design draws on the miniature resistors, condensors and other components commonly used in mobile phones. The low heat output of these devices makes heatsinking superfluous, while the design also means there's no need for the coil normally used to prevent high-frequency noise in digital amplification. 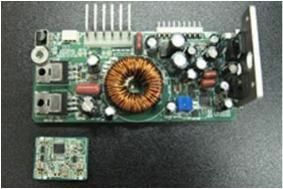 Onkyo says the new amp module, which will be commercially available in 2011, will cost little more than the chip-based amps commonly used in TVs and car audio applications.